Historic 1780’s Beach House with Large Veranda! Nestled on Cambridge Beach! Kitchen with oversized stove and oven, 2 x large fridges & two dishwashers as well as all the kitchen &equipment you will need to prepare a gourmet meal. Two grocery stores are a 5 minutes’ walk down Cambridge Road. Bus stop is 5 minutes’ walk. Air conditioning in all bedrooms. Stainless BBQ, large enough for a meal for 12 people. 2 x 55 led TV'S. Outdoor showers. 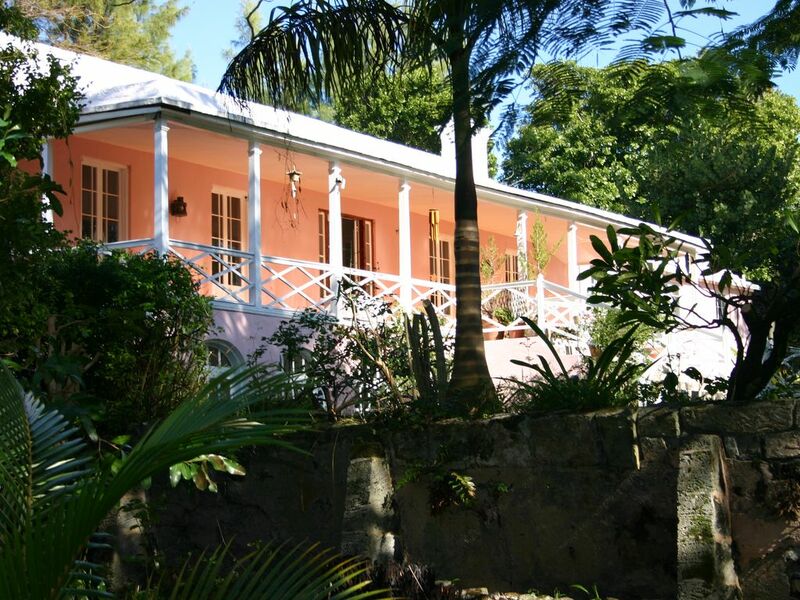 Comfortably decorated and renovated with all the modern conveniences, the gracious old Bermuda home is a wonderful venue for a family reunion, or a getaway for friends who want to enjoy a tropical setting. West End: Interesting places to see in the vicinity would include Dockyard. The extraordinary installation features a collection of spectacular buildings erected for navy re-provisioning in the very early 1800?s. The Maritime Museum out at Dockyard on Ireland Island has fascinating displays of items from Bermuda’s extraordinarily colorful past, fully restored. The Commissioners House is an iron structure with the most commanding view of the island to be seen anywhere- from end to end. Other handsome buildings now house art galleries, museums, cafes, artist’s workshops, theatres and pubs as well as a major ferry stop that will whisk you into Hamilton and on to St. Georges. Heading east by road towards Hamilton, you will be charmed with the town of Somerset- it has a post office and pharmacy, nice places to dine and little shops where you can re-provision while admiring the views and the mangrove-edged beach. Ely’s Harbour at Somerset Bridge has a small marina where you can rent boats and explore. Railway trail / Restaurants: The Railway Trail is nearby as well, and offers a peek into Old Bermuda, as the trail wends away from the main road and past some fascinating old homes and farms with jaw dropping views. The grand beaches at Horseshoe, Warwick Long Bay and Elbow are a short bus or moped ride away and some are serviced public beaches with cafes, beach chair and umbrella rentals available. The Watford Bridge terminal is half a mile walk away. The local Supermarket is close by as well and spirits are sold until 9pm, and groceries can be purchased there until midnight. Casual dining can be enjoyed at “Traditions Café” or the “Country Squire Restaurant” , Salt Rock Grill/Suishi, the “Frog and Onion Pub” Bonefish Grill, Amicci's 10 minutes away at Dockyard or next door at the resort at Breezes on the outdoor beach restaurant. We recommend Oleander Cycles as they have a kiosk next door at the Cambridge Beach Resort and Spa. Serial entrepreneur, love old houses and doing restorations. Love my fruit trees, and spending time in the garden, on the beach, and on the boat of course. It's a little bit of old Bermuda. I love the west end. Great community, friendly people, lots to do, and always close to the water. in the dining room, and also on the porch. You can seat two large tables and hold as many as 20. Great house for large groups-we were 13- beautiful grounds and beach and accomadating host Ben- we heartily recommend it!! We had a wonderful time with the family (8 adults) in Bermuda. The Cambridge House was well suited with plenty of living space and spacious bedrooms. The best part of the house is the front porch where we could lounge, eat meals and hangout. The kitchen was fully equipped for preparing meals. We loved the location for hiking, boating and relaxation. We explored the island by bus, ferry and taxi. We had some great meals at restaurants including; Blu, Village Pantry, Cambridge Beaches, Bonefish, Frog and Onion. The weather was pretty much mid to high 60's all week. We made it to the beach a couple of times (Elbow Beach, Horseshoe, Cambridge) but mostly hikded around the trails and towns. I would highly recommend this house and Ben was a responsive and gracious host. Ahhh, thank you. Your welcome back anytime., and hopefully you will get to experience our regular Christmas warm weather around mid 70's. Take care and safe travels. Cambridge House was the perfect place to share with my 4 siblings. The owner Ben was more than helpful and was a perfect tour guide. The location to facilities was ideal with an easy walk. One felt very safe and comfortable and everyone was extremely friendly. A great place to share special memories. Ahh, thank guys, It was good to meet you all. and it was good to have you as guests, perfect guests I might add, and hope to see you again. Thanks for leaving the house in excellent shape!! We completely enjoyed this lovely home. We were 2 families that rented the house for a week. The kitchen is well stocked with dishes and cooking utensils. The rooms are comfortable and clean and several have attached bathrooms. There are 2 bedrooms with a TV and the kitchen has a small TV. There is a stero so you can sit on the ample porch to relax in the evening and listen to music. Wifi is also provided. It is a short walk to the beautiful Cambridge beach and Mangrove bay. The bus stop and the ferry are walking distance as is the post office where you can buy the tickets. The grocery store is also walking distance. There is a water sports rental just down the street. This is a quiet, tranquil location perfect for people who want to enjoy the beauty of Bermuda on their own and who don't mind walking. Thanks Cathy, so glad you enjoyed the house. Your welcome back anytime, and with a discount for leaving it in such good shape. We have purchased another old historic 300 yr old "Belfield Estate" down the street which will be online in coming months. Its a 4 bedroom, and so if your a smaller party next time it may be perfect. Take care and hope to see you again. Golf: Port Royal Golf Course home of the PGA Grand Slam event, stunning ocean views, breathtaking Bermuda landscapes and one of the greatest holes in golf. Designed by world-renowned architect Robert Trent Jones Sr. in 1970, Port Royal has recently undergone a $14.5 million renovation, a complete makeover spearheaded by original design team member Robert Rulewich in preparation for the 2009/2010 PGA Grand Slam of Golf. With the support of the Bermuda Government, Port Royal is now one of the world’s premier public golf courses boasting TifEagle greens, a state-of-the art irrigation system and sweeping ocean views from nearly every hole. Add to that its 300-yard oceanfront driving range and the course’s luxurious clubhouse. Those left with any question might consider Port Royal’s signature hole. Widely regarded as one of the greatest par threes in golf, the 16th hole is a 238-yard crescent-shaped beauty with nothing but the Atlantic Ocean between the tee and the pin. Experience it for yourself and you too will understand why Port Royal is indeed the number one golf course in Bermuda. Summer Price: April 1 – Oct. 30 (includes Christmas-New Year Weeks): $6300 a week for 8 guests. $1,260 a day, for periods of less than 1 week. Winter Price: Nov. 1 – Mar. 31: $5500 a week for 8 guests. $1100 a day, for periods of less than 1 week. Holiday weekends and Christmas at Summer rate. $50 per night for each additional person, including children.